Using healthy weekly meal plans is a convenient way to ensure we keep up with our fast-paced lives, without sacrificing our healthy diets. 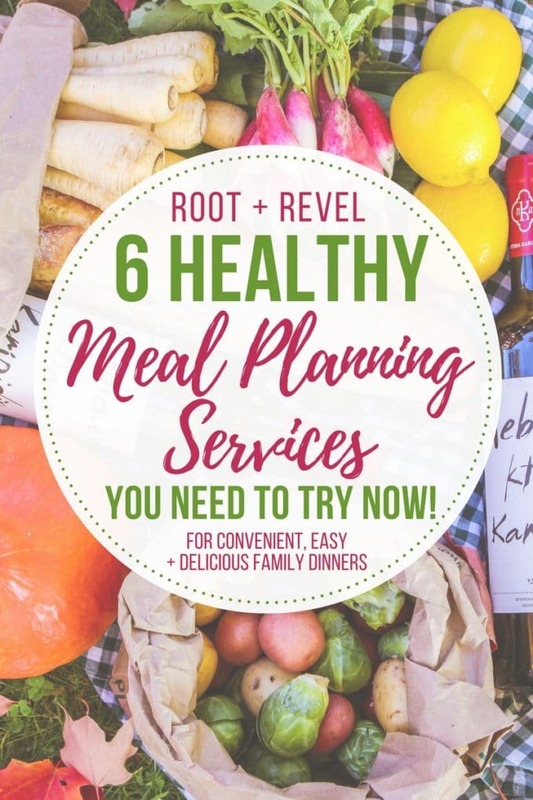 Whether you need a full service meal kit delivery to your front door, or if you simply want inspiration for healthy weekly meal plan ideas, the six resources below will save you time, reduce waste and make dinner easier and more convenient! 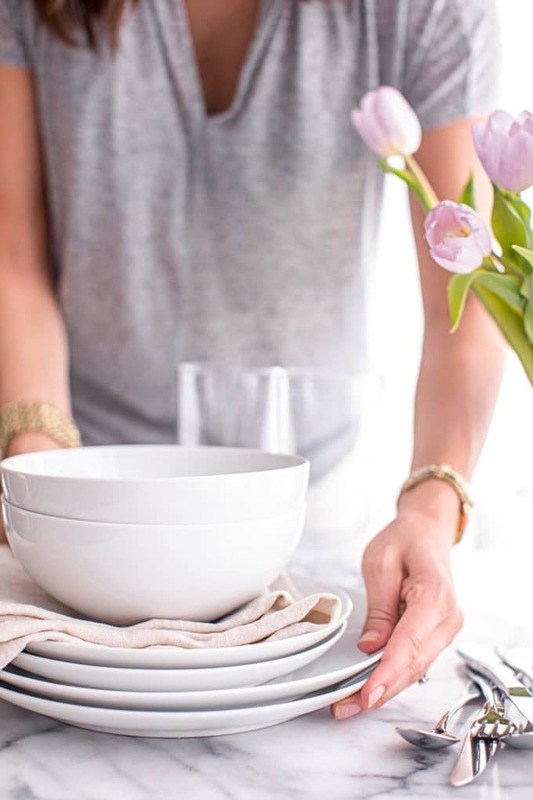 Let’s get real: our lives are busy and sometimes dinner can start to feel like a daily chore. Yet, you still want to sit down and have a nice, healthy meal together with your family – not rely on greasy take-out or processed microwavable meals. So what’s the solution? Healthy weekly meal plans to the rescue! These services have been popping up more and more over recent years to fill the need many home cooks, couples and families have of wanting to eat healthy, cook meals from scratch and enjoy dinner at home, without having to spends tons of time planning, grocery shopping and prepping. If this describes you, I highly recommend giving one of these healthy weekly meal plan services below a try. Nothing beats the convenience, while also keeping healthy homecooked meals a top priority. Even if you prescribe to a certain diet like paleo, gluten free or vegetarian, these meal planning services have you covered! Worry no more about “What’s for dinner tonight?” Let’s take a closer look. 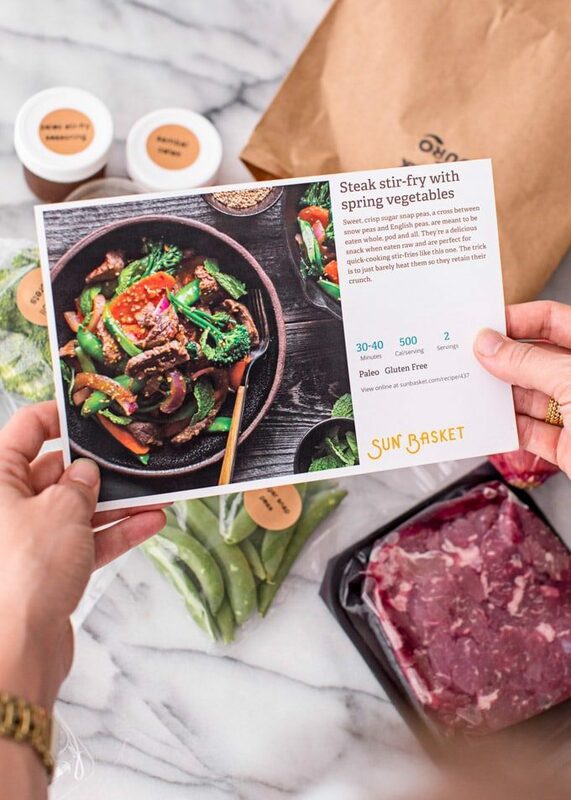 Though it’s not exactly a meal planning service, Sun Basket (my favorite healthy meal kit delivery service), takes all of the guesswork out of meal planning! I wrote an entire post about it here. Sun Basket creates inspired farm-to-table recipes using organic, sustainable ingredients and delivers weekly to your door. How it Works: Select your meal plan and recipes, then receive a box in the mail with pre-measured ingredients. No shopping required and meals are ready in about 30 minutes! Food Quality: Top quality ingredients, mostly organic and all produce is non-GMO. Meats are humanely raised, antibiotic- and hormone-free and seafood is sustainably sourced. Order today and get $35 off your first delivery from Sun Basket! The Fresh 20 provides easy meal plans for 5 dinners each week with just 20 ingredients. How it Works: You receive a shopping list each week to buy 20 fresh, local and organic ingredients (read: no waste!). Each shopping list is categorized with cost estimates and pantry staple reminders. Most subscribers say it takes less than 20 minutes to complete their shopping. Then, you follow their step-by-step guide to prep the entire week’s meals all in ONE hour at the start of your week, to save you valuable time during busy weeknights. Food Quality: Nothing is processed or frozen, and everything is preservative free. All meal plans are reviewed by their registered dietician. But, of course, you’re doing your own grocery shopping so you have ultimate control over the quality of ingredients that you buy. 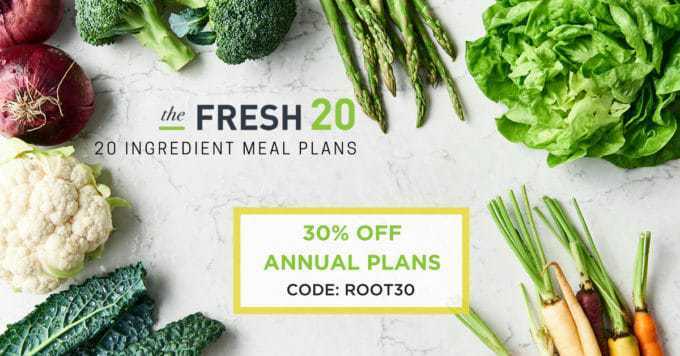 Find out more about The Fresh 20 here and get 30% off your annual plan with the code ROOT30! 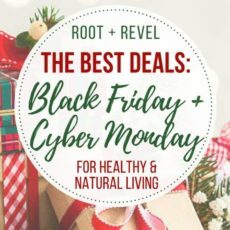 The annual plans are already discounted 25%, and now with an extra 30% off, you’ll pay just $51.80 for an ENTIRE YEAR of meal plans and shopping lists! 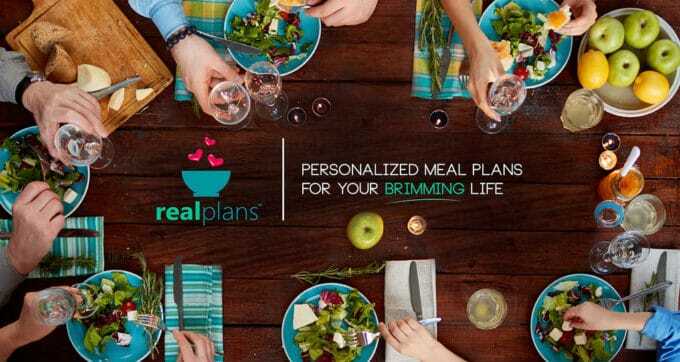 Real Plans creates customizable plans to suit your family’s size, busy schedule, and ever-changing needs. How it Works: Real Plans gives you access to over 1,500 curated recipes that have been tested in their kitchen and are family-approved. You can also pick your own meals from the Recipe Box or import your own (one of my favorite features if you prefer to meal plan with recipes from your favorite bloggers, hint hint!). This is super customizable, as you can drag and drop different recipes and move meals around to suit your specific needs. They then provide a grocery list for that week based on your selections. Food Quality: Given the variety of recipe options, you can choose what’s best for your lifestyle and dietary preferences, but all recipes are primarily whole foods based and come from some of your favorite food bloggers like The Paleo Mom, Whole 30, Wellness Mama, Cookie + Kate, Nom Nom Paleo and more! But, of course, you’re doing your own grocery shopping so you have ultimate control over the quality of ingredients that you buy. Diet Options: Your subscription will give you access to all of their meal plans, including Traditional (Gluten-Free, Dairy-Free and GAPS options), Paleo (Primal, Keto, and Autoimmune Protocol options), and Vegetarian (Ovo-lacto). No matter which of the above you pick, you can still refine your diet and exclude certain food groups or ingredients that don’t fit into any of the above plans, and Real Plans will still come up with a meal plan full of food that you can eat. Find out more about Real Plans here. Cook Smarts not only provides four new dinner meal plans every week, they go beyond meal planning with their how-to cooking videos, encouraging you to build a solid cooking foundation, waste less food and find joy in a home cooked meal. How it Works: In this monthly subscription service, you’ll receive fresh new meal plans every single week for four simple, balanced dinners, along with access to their 4+ year archive of weekly meal plans that you can swap out for any meals in your weekly plan. You can choose custom serving sizes (great if you live alone!) and get a grocery list in just one click. They also include nice features like optional weekend prep instructions to make weeknight dinners a breeze, and additional health info like Weight Watchers points and a My Fitness Pal log. Food Quality: Cook Smarts classifies their recipes as healthy, real food. But, again, you’re doing your own grocery shopping so you have ultimate control over the quality of ingredients that you buy. Diet Options: Every meal has a gluten-free, paleo, or vegetarian option – so you’re getting four meal plans for the price of one. Find out more about Cook Smarts here and get started with three free meal plans! For those of you looking for meal planning ideas but aren’t in need of an entire subscription service, my friend Maya Krampf from Wholesome Yum created an amazing resource: the Meal Planning Starter Kit. 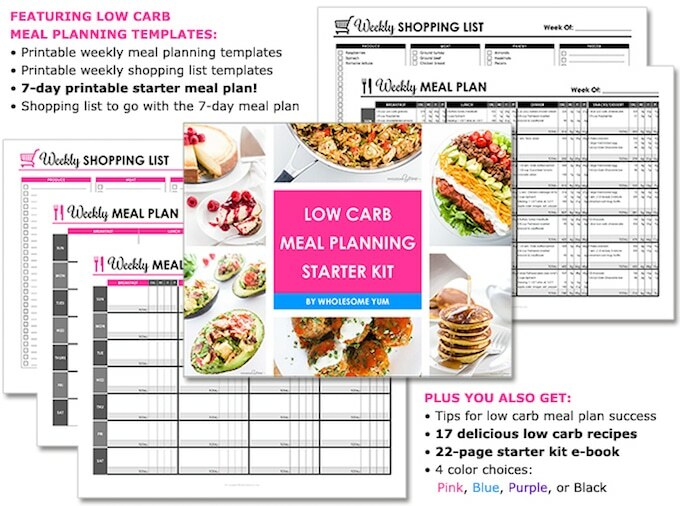 How It Works: The Meal Planning Starter Kit takes the guesswork out of low-carb meal planning. 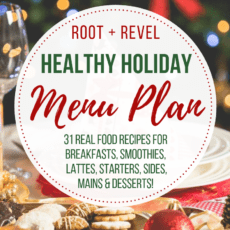 You receive a 7-day printable starter meal plan + shopping list, including healthy recipes for all your meals for 7 days – breakfast, lunch, dinner, snacks, and dessert! 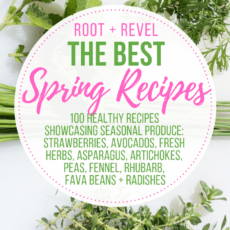 It also includes printable weekly meal plan and shopping list templates, tip for low carb meal planning success, a 22-page start kit e-book, and more! Food Quality: The healthy recipes are all complete with a macros breakdown. Since you’re doing the grocery shopping you have control over the quality of ingredients that you buy. Diet Options: Everything is low carb and gluten free. Buy this helpful resource now for just $9.99. Also, don’t miss Maya’s 30 Dinners in 30 Minutes e-cookbook, which features easy recipes with 10 ingredients or less, all of which are real food recipes, low carb, keto, gluten-free, and many are also paleo. She provides serving suggestions and variations for each recipe along with nutrition information. The book has an interactive table of contents for simple navigation, a versatile PDF format you can view on any device as well as a convenient printer-friendly layout. Get your copy here for only $9.99. Carrie Vitt is a Nutritional Therapy Practitioner who reversed Hashimoto’s disease, chronic migraines, IBS and eczema through unprocessed, organic food and detox – and now shares her wisdom on her site Deliciously Organic, where she also offers a healthy weekly meal plan service. How it Works: Each week you get a shopping list with 5 full dinner menus (each meal consists of one or two recipes), 1-2 desserts and 1 snack. The recipes are easy-to-follow and “kid approved”, and Carrie also provides helpful tips for getting dinner on the table quickly. Each recipe serves at least 4 people (some with leftovers!). Simply hit “print” and you’ll have your complete shopping list organized by category. Food Quality: Unprocessed, real food. Again, you’re doing your own grocery shopping so you have ultimate control over the quality of ingredients that you buy. Diet Options: Choose from classic, grain-free, gluten-free or paleo – or, pick the ‘All Access’ to get all 4! 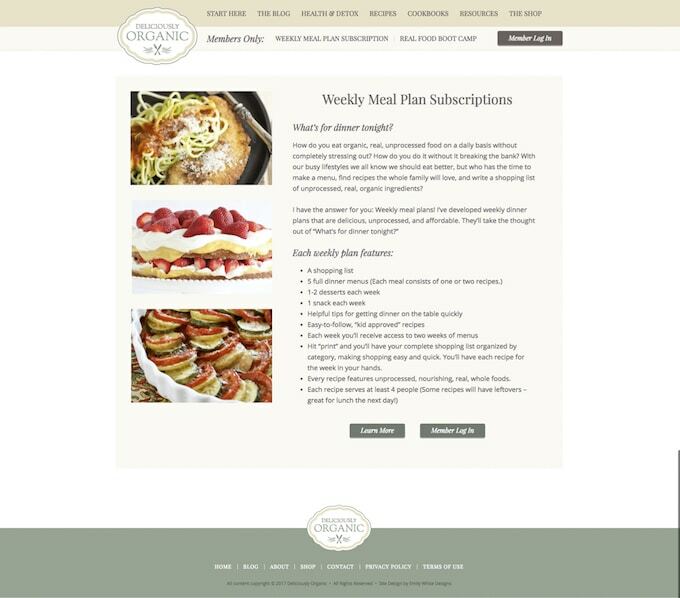 Sign up now for Delicious Organic’s Weekly Meal Plan Subscription. What are your favorite healthy weekly meal plans? Let us know in the comments below!